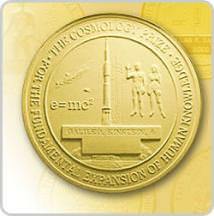 The design of the Gruber Foundation's first medal—for its Cosmology Prize—grew out of a brainstorming session involving Peter and Pat Gruber and Dr. Larry Tise, early consultant to the Foundation and President of the International Congress of Distinguished Awards. Peter suggested that the medal ought to reflect all that the award was intended to embody, including paradigmatic discovery (hence Einstein's E=MC²), the exploration of space (hence the NASA rocket being launched), and the fruits of that exploration (hence the Andromeda Galaxy, the first galaxy of stars outside of our own to be identified and photographed). But because everyone also agreed that the Cosmology Prize, at its core, stood for universal peace and understanding, we decided to include the friendly and benign naked human forms used by NASA on the Pioneer 10 probe, the first American exploratory craft to exit our solar system. Peace, discovery, and exploration: these were the ideas we hoped to capture in the Cosmology medal, and in the symbols that eventually coalesced in the representation developed by Dr. Tise and the medal designer.